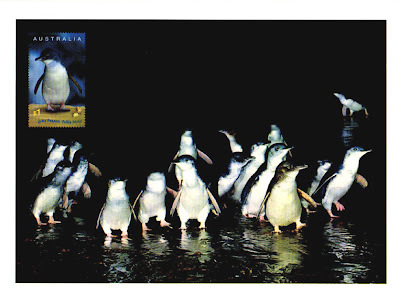 eD@HoMe: Nice postcard from Phillip Island Penguin Parade! Here is a lovely postcard that I posted to myself from the Phillip Island, Victoria during my hoilday in Australia last week. This postcard depicts the "Penguin Parade", where each night at sunset the world’s smallest penguins, the Little Penguins, emerge from the sea and waddle ashore to their sand dune burrows after a hard day's fishing. This pre-paid postcard costed 2 Australian dollars for posting in Australia and delivery worldwide. 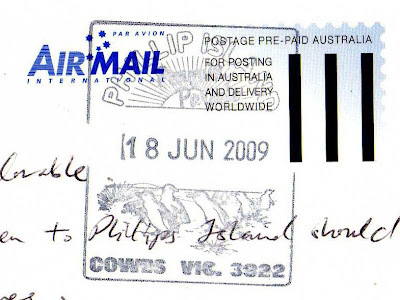 I deposited this postcard into the post box on 16th June, it was hand stamped with a nice Phillip Island Penguin Parade postmark on 18th June and reached me today! Photography and Video are banned at the Penguin Parade. The flash lights of the cameras can make the penguins blind! However, I managed to find this video clip on the internet. (Someone actually managed to smuggle a camcorder in! Anyway camcorders do not need a flash light when using the night vision option so I don't think it did any harm to the penguins). Just enjoy!